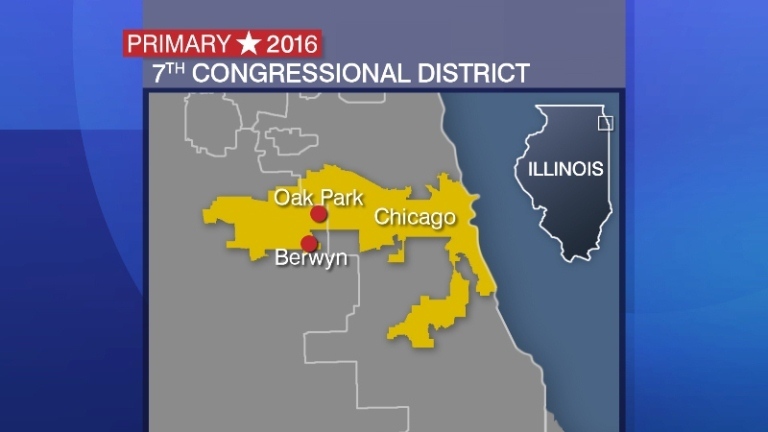 Illinois' 7th Congressional District is a sprawling district that incorporates downtown Chicago, the Near North Side and parts of the South and West Sides. It also extends into west suburban Cook County, including parts of Bellwood, Forest Park, Oak Park and Maywood. On the ballot for the March primary are two Democratic candidates: incumbent Congressman Danny Davis and challenger Thomas Day. No Republican is on the ballot. Davis and Day join us to share their vision for the 7th district and the country. Watch the video to hear our full discussion with Davis and Day. Danny K. Davis is the incumbent congressman for the 7th Congressional District. He was first elected to the House of Representatives in 1996. Rep. Davis serves on the Oversight and Government Reform Committee and is also on subcommittees including: Economic Growth, Job Creation and Regulatory Affairs; Energy Policy, Health Care and Entitlements; and the Subcommittee on Human Resources and the Committee on Ways and Means, including the Subcommittee on Oversight. Rep. Davis is also a member of the Congressional Black Caucus, the Progressive Caucus, the Urban Caucus and more. In the 113th Congress, Rep. Davis has focused on job creation, poverty, health care, education, youth and criminal justice reform. Rep. Davis was born in Parkdale, Arkansas and moved to Chicago’s West Side in 1961 after graduating from Arkansas A.M. & N. College. He also has Master’s and Doctorate Degrees from Chicago State University and the Union Institute in Cincinnati, Ohio, respectively. He is married to Vera G. Davis and has two sons. Challenger Thomas Day is an Iraq War veteran who served five years in the Army’s 101st Airborne Division, which included one year in Iraq. After serving in the military, Day was a journalist for several years. He worked as a bureau correspondent in Afghanistan in 2009 and 2010, with his work being published in the Washington Post and CNN.com. Day is the author of a book, “Along the Tigris: the 101st Airborne Division in Operation Iraqi Freedom,” an account of the division’s 2003 to 2004 Iraq tour. Day co-created The Bunker, a nonprofit business community that supports veteran entrepreneurs and small business owners, with two other Iraq War veterans. He wants to address helping the middle class and small business owners, ending mass incarceration and building a “strong and smart” national defense strategy. Day graduated from Penn State University and has a Master’s from Northwestern University’s Medill School of Journalism and the University of Chicago’s Harris School of Public Policy. The 7th Congressional District is home to 727,478 residents. Of those residents, 361,907 identify as black or African-American, 243,309 identify as white and 107,665 identify as Hispanic or Latino. Below, see how residents identified themselves in a 2014 American Community Survey. Of the population, 587,498 are estimated to be age 16 and over, with the unemployment rate estimated at 12.6 percent. The average income per household is $81,453, according to the U.S. Census Bureau. Below, see the income and benefits (in 2014 inflation-adjusted dollars) per household.